On a small island in the Mediterranean, it comes as no surprise that the seafood here is amazing. Fresh, tasty and delicious. So, make sure you try some of the more traditional dishes in traditional places! At a tiny beach shack overlooking a beautiful secluded cove that can only be reached on foot, is where you can enjoy a Sardine Feast! Crystal clear waters almost force you to go for a dip too! The little restaurant perched on the rocks just after the beach of Cala Mastella is famous for traditional lunches of bullit de peix and an awful lot of wine drinking followed by a piping hot cafe caleta to really finish you off. If you think you can handle it, ask for your wine in a porron and your meal here at El Bigotes is one you will not forget! A paella is a must while you´re in Ibiza and there are a million places that really do make a fantastic paella. Most beach restaurants serve amazing rice and fish dishes with salad and alioli to go with them and almost all the Spanish restaurants do too. Don´t forget that there are many different types of paella and you can get anything from a seafood paella, to a mixed one or even what is known as a "blind" one with no bones or bits!!! Tapas are the perfect way to try everything all at once. Just order a selection of these mini dishes and go crazy! From montaditos to frito de pulpo, from pimientos del padrón to boquerones... ¡¡mmmmmm que bueno!!!! Tapas can be found at most Spanish bars, restaurants and even cafés so no problem there! If you love fresh Serrano ham, check out the Cafeteria El Puntal in the port of Santa Eulalia. 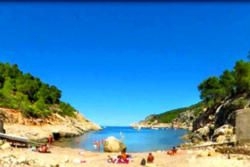 Take a look at our travel articles page to find out more about Ibiza restaurants & food.